Jenny Hinton has an honours degree in Podiatry from the University of Brighton. Prior to working in Cambridge, she worked in Private Practice at a Multi-disciplinary clinic in Surrey, working alongside Osteopaths and Sports Therapists gaining a valuable insight into alternative assessment and treatment techniques. While at the clinic she undertook chiropody clinics, biomechanical assessments and regular diabetic foot assessments. 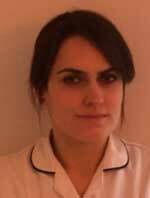 Jenny also previously worked as a Sports Massage therapist having qualified in 1999. She worked at some large sporting events including the London Marathon and the London Triathlon. Jenny gained further qualifications in Sports Injury Management and Rehabilitation, and Fitness Instruction in 2002. She has worked with both semi-professional and professional football clubs, including two seasons with Charlton Athletic Football Club, before qualifying as a Podiatrist. Bsc Honours Podiatry S.R.Ch. M.Ch.S. Gary Hinton studied at the University of Brighton and gained a BSc (Hons) degree in Podiatry. Upon graduation, Gary began working for the NHS in Northampton where he was exposed to a variety of foot conditions ranging from routine chiropody to diabetic wound care. Gary now works full time in private practice. His main focus of work is that of routine foot problems such as skin and nail problems, ingrowing toenails and verrucae. Gary has a particular interest in performing nail surgery procedures and ensures he carries out the most up to date protocol by attending regular training and refresher courses.